distribution of polar bears (light gray). ice-covered seas of the Northern Hemisphere. 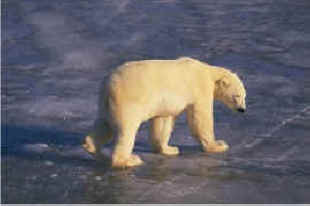 The polar bear or the sea/ice bear are the world's largest land predators. They can be found in the Artic, the U.S. (Alaska), Canada, Russia, Denmark (Greenland), and Norway. Each of these countries either banned hunting or established rules for how many polar bears could be hunted within its own boundaries. These rules help keep polar bear populations stable. 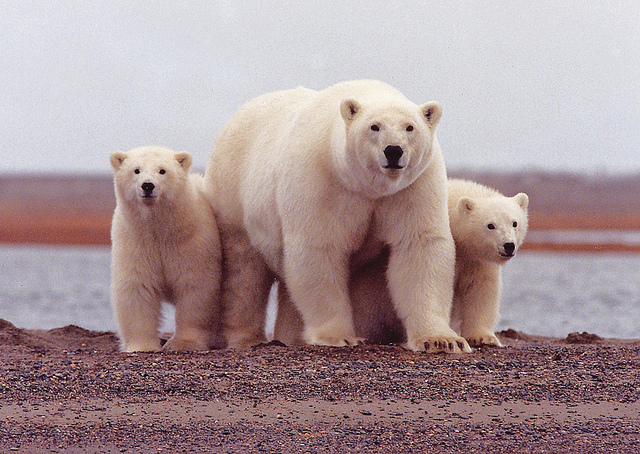 Today, 25,000 to 40,000 polar bears roam the Arctic. Around the age of four or five the female polar bear can start having babies. They usually only have two cubs and they have these babies in a cave they've dug in a large snow drift. They stay there over winter and come out in spring with the babies. Pair of polar bear cubs. Male polar bears may grow 10 feet tall and weigh over 1400 pounds. Females reach seven feet and weigh 650 pounds. In the wild polar bears live up to age 25. Despite what we think, a polar bear's fur is not white. Each hair is a clear hollow tube. Polar bears look white because each hollow hair reflects the light. 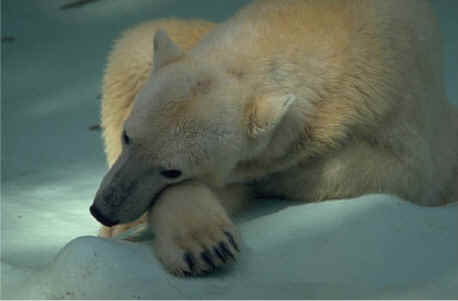 On sunny days, it traps the sun's infrared heat and keeps the bear warm at 98 degrees F (when they're resting). and the larger is the hind track. Polar bears have wide front paws with slightly webbed toes that help them swim. They paddle with their front feet and steer with their hind feet. Paw pads with rough surfaces help prevent polar bears from slipping up on the ice. Polar bears have been known to swim 100 miles (161 kilometers) at a stretch. They have a special liver that allows them to process all of the seal fat they eat - seals store a lot of vitamin A in their blubber which allows them to survive and grow quickly. A polar bear's liver contains 10 times more vitamin A than any other animal on earth - their liver has evolved to allow them to process and eat all of the seal blubber they need to stay alive. Sometimes the polar bear stalks its prey. It may see a seal lying near its breathing hole and slowly move toward it, then charge it, biting its head or grabbing it with its massive claws. 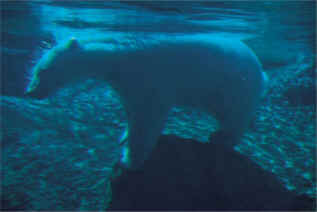 A polar bear may also hunt by swimming beneath the ice. Humans are the polar bears only predator. Baby polar bears often starve. In fact, 70 percent do not live to their third birthday. 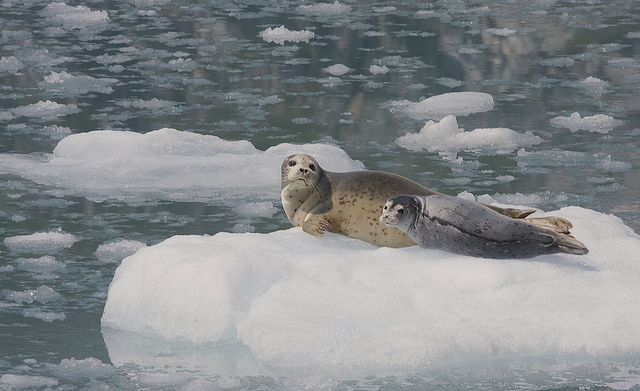 Sometimes seals are hard to find, especially in the summer when the ice has melted. All across the Arctic, man is moving in to mine oil and coal and there is less space for the polar bear to live. Oil spills can be very dangerous. A bear with oil on its coat cannot regulate its body temperature properly. If the bear eats the oil while grooming it could die. Man made pollution is also a cause of death. At each stage of the food chain, pollutants get more concentrated. By the end when the polar bear eats the seal and it could be lethal. 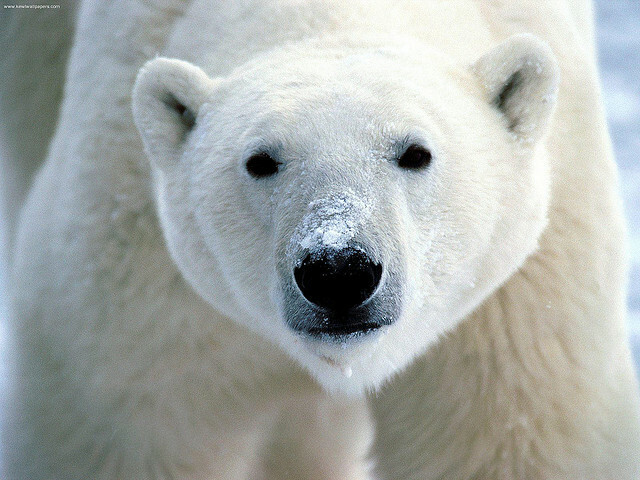 Polar Bears are considered marine mammals -- just like seals, whales and dolphins. Although polar bears are related to the brown bear, they have evolved over time to live in cold northern arctic climates. Their population is on the decline and they are considered a "vulnerable" species. 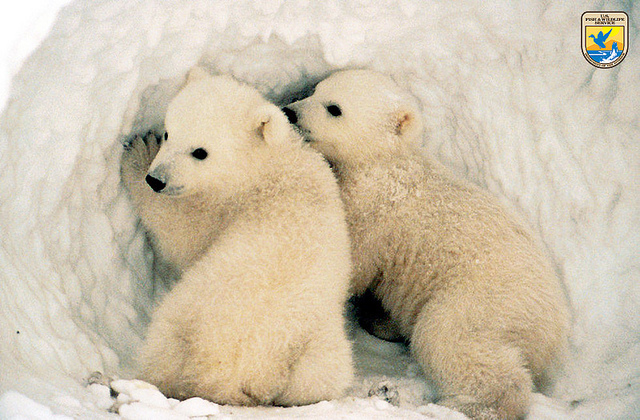 Protecting polar bears isn't just a matter of being nice. Their body is very different than most mammals -- they are able to process large amounts of fat (seal blubber) and are able to lose and gain large amounts of weight through the year without causing stress health problems. Scientists are studying them to see if they can provide a key to human diseases like diabetes and heart disease!